Three of the 19 women featured in “The Amazing Women” on Titanic,” Irene (Renee) Harris, Eva Hart, Violet Jessop. Jamie Terrell, the First Class Maid on Titanic Museum Attraction Attraction in Branson said that this is the attraction’s 12th year in Branson and that every year they feature a different theme. 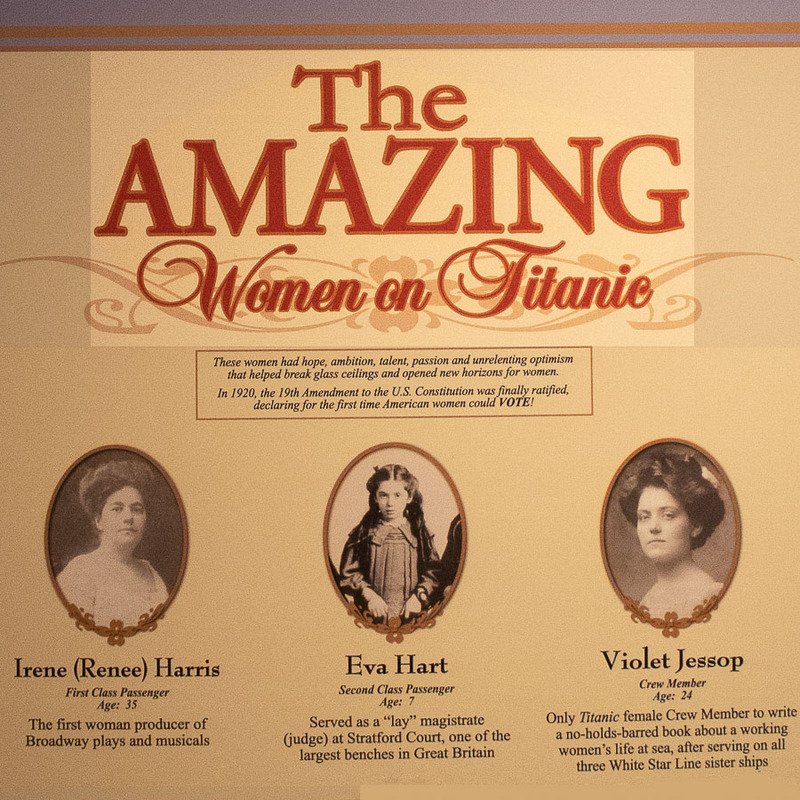 “This year it’s ‘The Amazing Women on the Titanic’ featuring 19 women who did things that women weren’t supposed to be doing, but they did it anyway. Some did it before sailing on the Titanic and some afterwards, but they were all among the first to break what is today called the “glass-ceiling,” and made a huge difference in the early struggle for the rights women enjoy today. “These women were visionaries, spearheading cultural revolution,” said Mary Kellogg, the Titanic Museum Attractions’ President/COO and co-owner. “In 1912, if a woman spoke her mind in public, she was considered rebellious, but speak up they did, and the world heard them roar. These amazing women’s personal and professional stories are riveting and intimately revealing,” she continued. Today, the world is full of successful women in just about any endeavor imaginable. Their ability to succeed is limited only by their talent, effort, and persistence. It’s hard to imagine a time when that was not the case but, during the early 20th century, before women even had the right to vote the prevailing philosophy was that “a woman’s place was in the home” and there were not a lot of women in the work place, let alone in leadership or ownership positions. Yet, even then, before the term “glass curtain” had been invented, there were early pioneers. Their actions made such a difference that the flaws in that philosophy gradually became evident, opening forever changing the opportunities for women, not only in the work place, but in virtually every area of life. Titanic First Class Maid Terrell said that the exhibit features the exciting and revealing personal and professional stories of these amazing women and their accomplishments. She goes on to point out that among the highlights is the “Lucile Collection,” featuring fashions designed by Lucy, Lady Duff Gordon who, ahead of her time, was one of the world’s leading fashion designers, the “Armani” or “Versace,” of her day. Not only was she the first woman to have a successful fashion line, she was the first to use the runway and models to preview her fashions. She designed everything from gowns and dresses to negligees, setting the fashion world aghast at some of her “daring” and “revealing” fashions. So much so that it was included in the movie “Titanic.” While at the ball, Rose points out Lady Duff Gordon and her husband to Jack saying, “And over here, we have Sir Cosmo and Lucile, Lady Duff-Gordon. She designs naughty lingerie, among her many talents. Very popular with the royals.” The story of how Lady Duff Gordon and Cosmo go off the Titanic together adds additional excitement and mystery to this amazing lady’s story. This entry was posted in Branson Attractions, Featured on September 24, 2018 by Gary Groman.